Baby Asian elephant hiding in a forest of Mom’s legs. 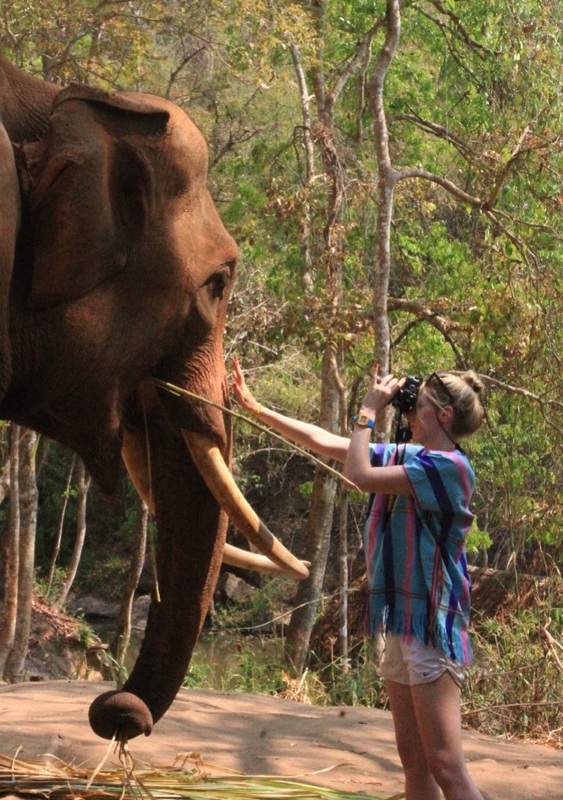 Most tourists plan to see elephants in some capacity when they visit Thailand. 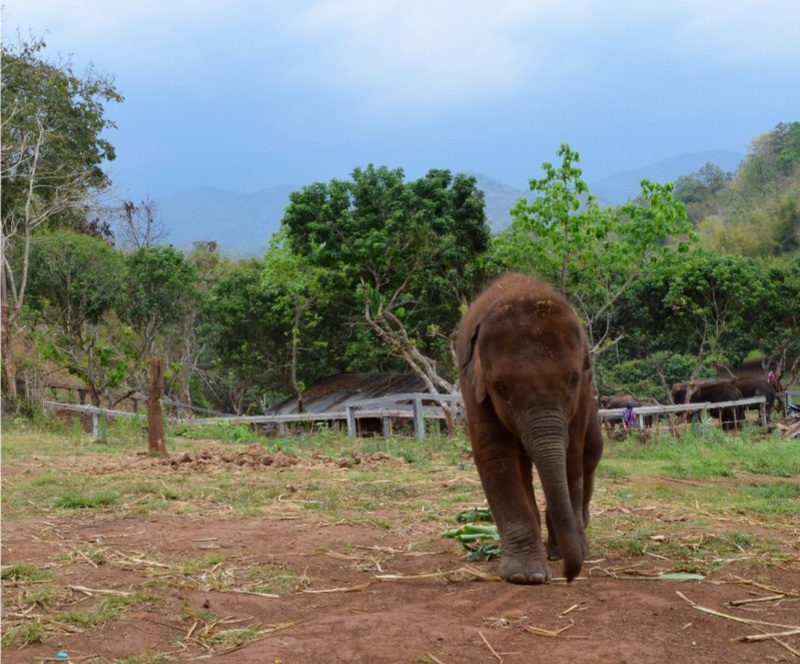 I was no different…except that I nearly tweaked out trying to find the perfect elephant sanctuary to visit. I did a lot of research to find a place that did not compromise their welfare. 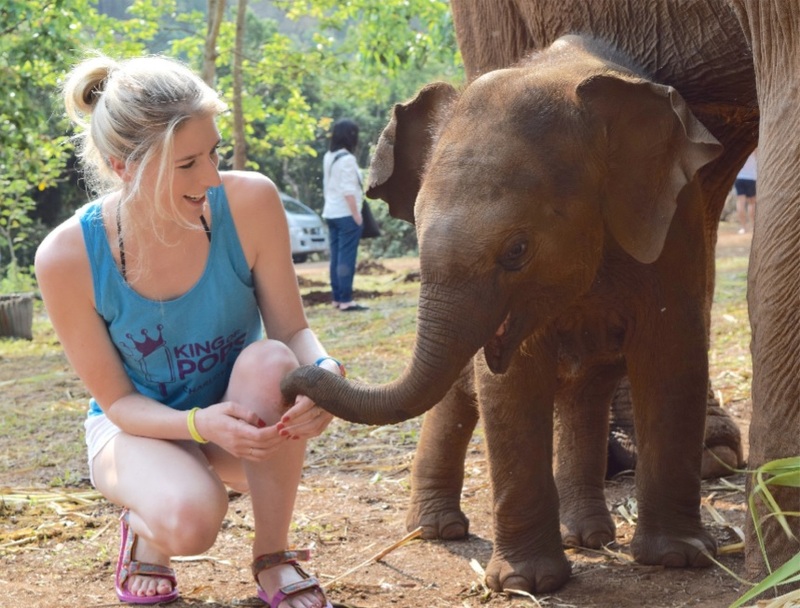 Thailand is known for its elephant experiences, but many of them are inhumane. In general, captive animal facilities range from sanctuaries where an animal is as free as possible from outside human interaction, to places where animals are exploited for money and entertainment. While some cases are black and white, most of the elephant experiences fall in a gray area. It is then up to you to decide where you stand on what is appropriate. When you are researching animal experiences, make sure to include terms like “welfare” and to look up reviews. You will surely get opinions from people both ends of the spectrum, but it should give you enough of an idea to make an informed choice. But beware: businesses that do not have humane practices will not advertise that on their website, so extra research is important. 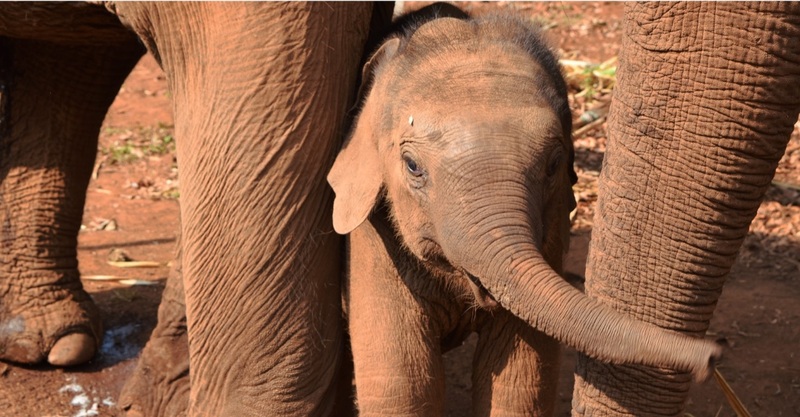 I chose Patara Elephant Farm because an elephant researcher that I trust vouched for it. I felt that it did a good job of balancing eco-tourism with elephant welfare. That said, it is a balance. Patara provides an experience where you can directly interact with their animals, which attracts more tourists (and money for conservation) than a sanctuary probably would. As a trade-off, these elephants are (unknowingly) giving up some of the autonomy they could have at a sanctuary, by essentially going to work every day and interacting with strangers. They are likely living enriching lives, and may be safer than they would be with no protection, but they did not choose this life. In the zoo field, animals that interact with humans are often called animal ambassadors and these elephants are no different. 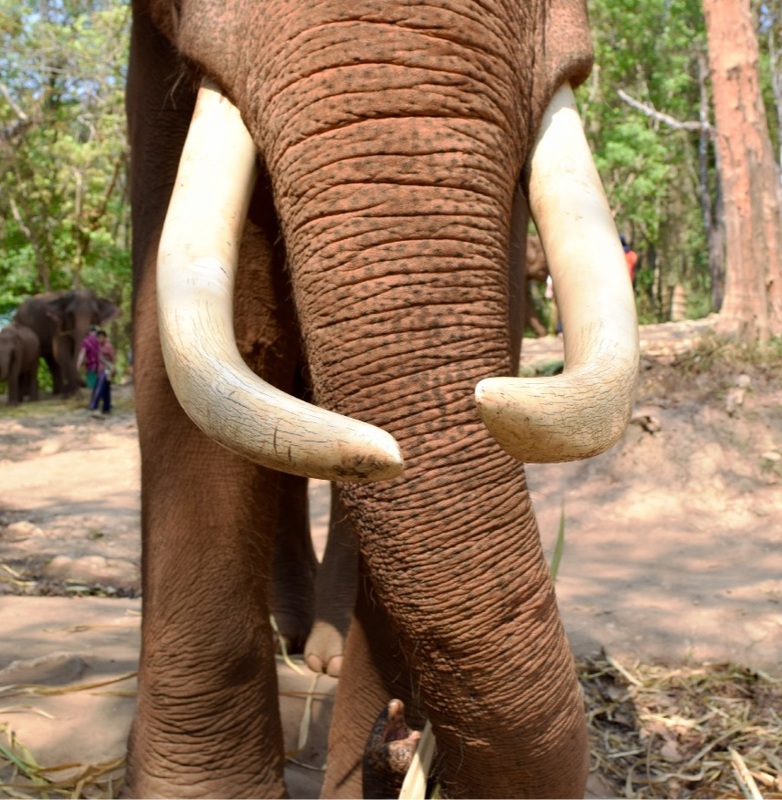 The elephants are giving up some of their freedom to provide us with life changing interactive experiences that teach about, and hopefully engender support for, their species. So while I enjoyed interacting with these elephants, I couldn’t truly know if they wanted to interact with me. It is a complicated science to determine what animals want, and why they choose different things. It is even more difficult when a species, like elephants, has had a difficult history with humans. They may not always realize they have a choice. Baby spotted our lunch and made a break for the picnic table! Learning this was the best and worst part of my animal behavior education. It’s hard to give up the fantasy that all animals want to hang out with you all the time. That said, thanks to my pre-trip research, I can be fairly certain that the elephants I met were well cared for, and hopefully did not mind us humans hanging around. Our program did involve riding the elephants (directly on their backs not on a wooden carrier) for a walk through the forest. I’ve heard mixed reviews on how this affects elephants, from “they could care less” to “it’s not good for them.” In retrospect, the riding was not my favorite part, and I’m still deciding how I feel about it. 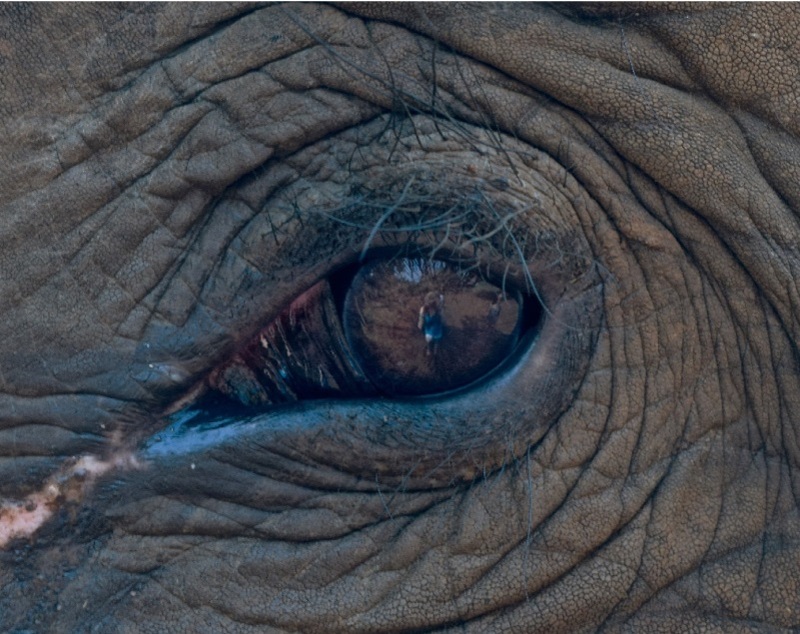 I spy in the elephant’s eye: myself! And after that giant disclaimer, I would like to add that this was one of the most meaningful experiences of my life. 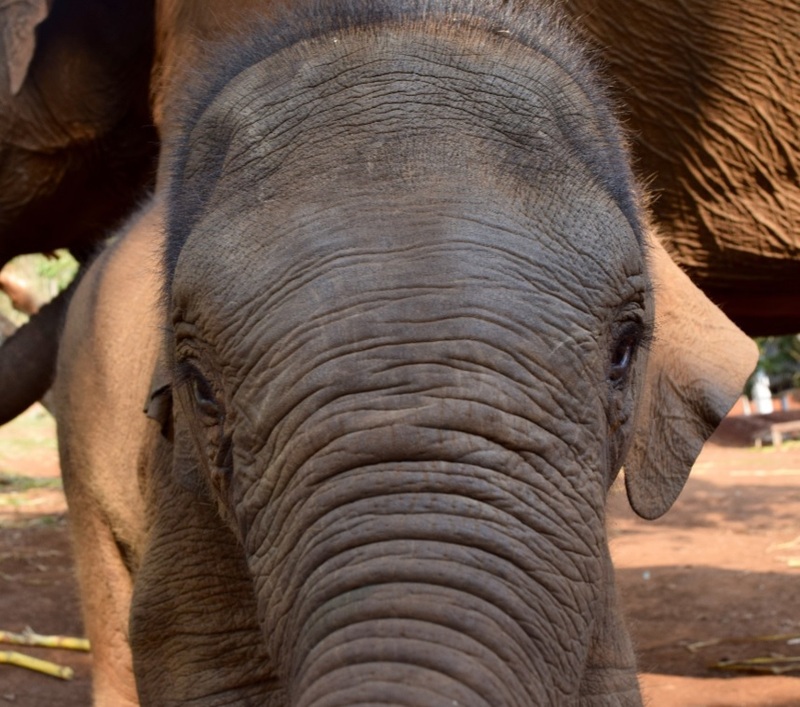 If you plan to see elephants in Thailand or anywhere, make sure that the money you pay goes to elephant care and conservation, and do your due diligence. The point of these experiences is to inspire awe and support, not entertain. If this post was as clear as mud, here is a much more articulate and well-balanced explanation of how elephant ecotourism works!